PHILADELPHIA, PA - With their fifth-round pick (165th overall) of the 2017 NFL Draft, the Detroit Lions selected former University of San Diego cornerback Jamal Agnew, making him only the second player in USD history to be selected in the draft. Quarterback Josh Johnson was also taken in the fifth round in 2008. Agnew finished his USD career as the program's all-time leader in passes defended with 59. 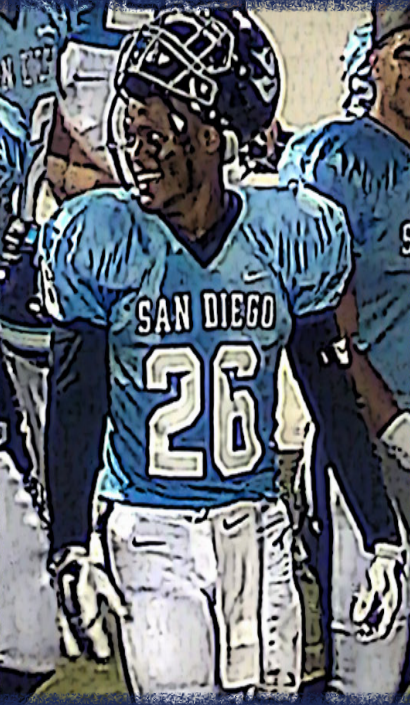 In 44 career games for the Toreros, the Point Loma High alum totaled 148 tackles (118 solo), with 12.5 tackles for loss, 1 fumble recovery and 11 interceptions. SANTEE, CA - The San Diego Surge (3-1) are no longer undefeated at home after falling to the Central Cal War Angels (4-0) in front of a packed house at Santee Community Stadium. A touchdown run by Adriana Gutierrez gave the Surge an early 7-0 lead, but they were unable to find the end zone again as the War Angels took control of the game. Costly turnovers and a powerful run game helped Central Cal break off a 44-0 scoring run to seal the win, cutting the Surge lead in the all-time series to 4-3. Next Saturday, the Surge will look to get back in the winner's circle as they continue their home slate against the Kern County Crusaders. PHOENIX, AZ - Looking to bounce back from last week's devastating loss at Sacremento, the North County (2-1) needed just one score to earn a hard-fought road win over the Pheonix Phamtomz (2-3). Next week they return home to host the Nevada Storm in a rematch from last season's thrilling contest, where the Stars pulled off a 46-40 victory.